ModernMom.com asked me for a little tutorial for their "crafternoon" series. I don't have any kids, but I know some moms, so maybe that qualified me? 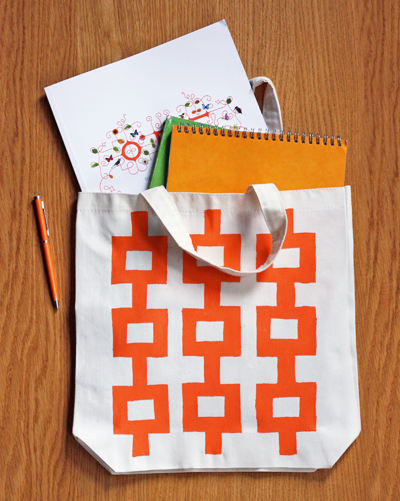 I sent over an easy stenciled tote bag project. Head over there for the instructions. P.S. Happy Halloween! You are so clever! I have to make one. A while ago I was swaping decoratedtote bags with friends, we really enjoyed it. Pretty cute, even if you're not a modern mom (or any other kind). It's a great design, really striking. I'm heading over!